Danny Dyer will follow the likes of Marge Simpson, Sharon Osbourne and Ali G in giving Channel 4's Alternative Christmas Message. The EastEnders actor memorably slated Brexit and former Prime Minister David Cameron on TV earlier this year. It's thought he'll say that Westminster has seen "more backstabbing than in Albert Square". 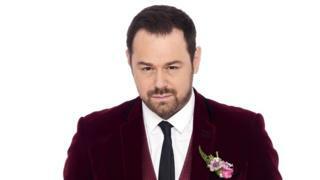 Channel 4's described Danny as the "the unofficial man of the people". In the preview clip, Danny is sitting at a festively decorated table, sipping tea out of a royal wedding mug with the faces of Prince Harry and Meghan on the front. The 41-year-old star will once again give his views on the state of the country's leadership. "That shambles down in Westminster, what a palaver that is," he says. "I mean, where are our leaders? Where are they? There's been more backstabbing than we have in Albert Square." In the summer his rant aimed at the state of politics and David Cameron went viral - we can't repeat most of what he said. He'll also have a dig at the US President Donald Trump, who was criticised in November for cancelling a visit to a Remembrance Day service in France "due to the weather". Danny says: "It ain't any better for the Yanks though, is it, you know. What an absolute melt they've got there. "He don't want to turn up to memorials because it's raining. He don't fancy a little trip to Britain because there's people here that just don't like him. Leave off." In the new year, the actor will star in a new BBC show, called Danny Dyer's Right Royal Family - which will see him eat, dress and live like his ancestors. The idea came after he found out he was related to royalty on Who Do You Think You Are? Channel 4 has run its Alternative Christmas message since 1993. It's ranged from a light-hearted look at the year, with hosts like Adam Hills, Jamie Oliver and Marge Simpson - to serious reviews of the year fronted by Brendan Cox, husband of murdered MP, Jo Cox. Last year, it was presented by survivors of the Grenfell Tower disaster.